With standard, triaxial processing (X, Y, Z), the tool can only be processed from one side – vertically from above. If you want to work on the rear as well, you will have to turn the tool around after the first operation and begin a second operation. However with a rotation axis (available as an extra feature) you can rotate a tool to any angle you please and process all sides to 360°. In the following description, it is assumed that the rotational access is already attached to the control and the parameters (resolution, speed, etc.) is correctly set in the machine parameters. The steps necessary for installation can be found separately in the documentation for the rotational axis. The so-called barrel engraving is the simplest processing method using the rotational axis. For this method, the usually flat processing level (XY) is „wrapped around“ the circumference of a cylindrical surface. If the rotational axis is parallel to the X axis, then e.g. instead of the Y axis, the rotational axis (A) is moved. In order to prevent a distortion of the image, the tool diameter must be determined. This is required so that the control can calculate how many degrees of rotation is required in order that the surface retracts a specific amount. No special CAM program with rotational axis support is required for barrel engraving. You can even use an existing NC program, originally only used for level processing of flat sheet material, for barrel engraving. Where is the rotation axis mounted? You must enter information about whether the rotational axis is parallel to the X or Y axis in the Machine Configuration (Menu Configuration -> Machine -> Special -> Barrel Engraving). Normally, the rotational axis is mounted along the long side of the machine parallel to the X axis. In this case, select „Y axis is projected onto A axis“ and activate the „Position is determined by the current zero point“, as shown in the image below. The tool’s diameter and the Y and Z positions of the rotational axis are not significant right now and will be entered later. After you have placed the tool in the rotational axis, the tool’s zero point must be set vertically over the centre of the material’s surface. With an A rotational axis parallel to the X axis, proceed with the tool so that the cutting tip touches the top side of the cylinder (the tube or the rod) and set the Y and Z coordinates to zero. To find the centre point precisely in the Y direction, you can either touch the tool from both sides or in place of the actual work piece, you could first clamp a cylinder pin in the jaw chuck, the diameter of which is the same as the tool’s, run the pen and the cutter congruently and set the Y axis to zero. 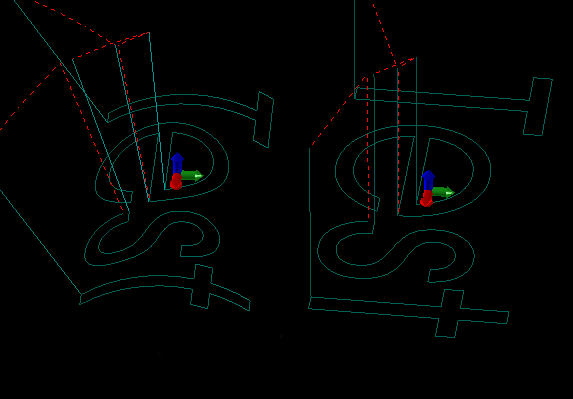 Then you can clamp the real work piece again and set the Z coordinate to zero on the upper side. Now load the NC program. The tool path will be displayed as „flat“, i.e. parallel to the XY level. 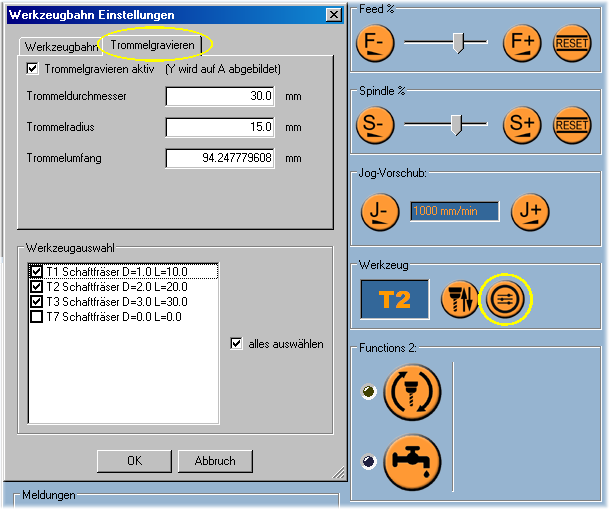 Now hover over the button on the right of the tool display (see figure above on the right) in the tool path dialogue box. Change to the „Barrel Engraving“ tab and activate the tick in „Barrel engraving active“. If you enter the correct tool diameter (or alternatively the radius or the scope) and close the box by clicking „OK“, the graphic will be reconfigured once more and the tool path appears curved, i.e. wrapped around an imaginary cylinder. The image on the left shows an engraving with barrel engraving engaged and then a „flat“ engraving, i.e. with the barrel engraving functionality switched off. If you want to process a „normal“ piece again after completely the work, you should shut off the Barrel Engraving option. If the path preview looks odd, or you receive inexplicable error messages, these could be signs that you forgot to shut it off.